We left the story of Grothendieck’s Lasserre notes early 2015, uncertain whether they would ever be made public. Some things have happened since. Georges Maltsiniotis gave a talk at the Gothendieck conference in Montpellier in june 2015 having as title “Grothendieck’s manuscripts in Lasserre”, raising perhaps even more questions. 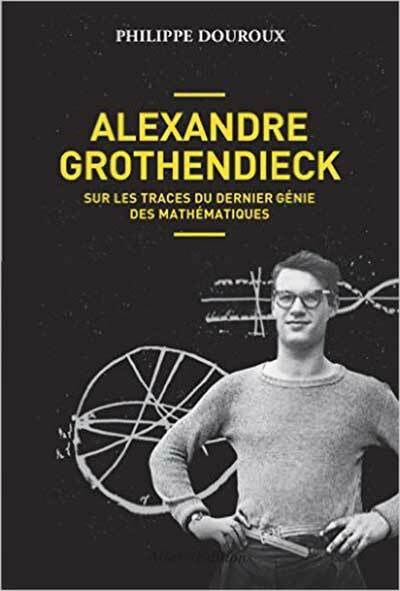 Philippe Douroux, a journalist at the French newspaper “Liberation”, had a few months ago his book out “Alexandre Grothendieck, sur les traces du dernier genie des mathematiques”. In the first and final couple of chapters he gives details on Grothendieck’s years in Lasserre. In chapter 46 “Que reste-t-il du tresor de Grothendieck?” (what is left of Grothendieck’s treasure?) he recounts what has happened to the ‘Lasserre gribouillis’ and this allows us to piece together some of the jigsaw-puzzle. Below is the relevant part of the picture taken by Edouard Balzin, mentioned in the post. The first three texts are given with plenty of details and add up to say 5000 pages. The fifth text is only given the approximate timing 1993-1998, although they present the bulk of the material (30000 pages). – Why didn’t Maltsiniotis give more detail on the largest part of the collection? – There seem to be at least 15000 pages missing in this roundup (previously, the collection was estimates at about 50000 pages). Were they destroyed? – What happened to the post-1998 writings? We know from a certain movie that Grothendieck kept on writing until the very end. If you have read Scharlau’s biographical texts on Grothendieck’s life, the middle part of Douroux’ book “Alexandre Grothendieck, sur les traces du dernier genie des mathematiques” will not be too surprising. However, the first 5 and final 3 chapters contain a lot of unknown information (at least to me) about his life in Lasserre. The story of ‘his last friend Michel’ is particularly relevant. Michel is a “relieur” (book-binder) and Grothendieck used his services to have carton boxes made, giving precise specifications as to their dimensions in mms, to contain his writings. In the summer of 2000 there’s a clash between the two, details in chapter 4 “la brouille du relieur”. As a result, all writings from 2000-2014 are not as neatly kept as those before. Each box is given a number, from 1 to the last one: 41. Carton box 1 : “Geometrie elementaire schematique” contains 1100 pages of algebra and algebraic geometry which Maltsiniotis classifies as “assez classique” but which Douroux calls ‘this is solid mathematics on which one has to work hard to understand’ and a bit later (apparently quoting Michel Demasure) ‘we will need 50 years to transform these notes into accessible mathematics’. Carton boxes 2-4 : “Structure de la psyche” (3700 pages) also being (according to Douroux) ‘a mathematical text in good form’. Carton boxes 5-16 : Philosophical and mystical reflexions, among which “Psyche et structure” and “Probleme du mal” (7500 pages). That is, we have an answer to most of the questions raised by Maltsiniotis talk. He only consulted the first 16 boxes, had a quick look at the other boxes and estimated they were ‘more of the same’ and packaged them all together in approximately 30000 pages of ‘Probleme du mal’. Probably he underestimated the number of pages in the 41 boxes containing all writings upto the summer of 2000. You will notice the expertly Michel-made carton boxes and a quick count of the middle green and rightmost red metallic box reveals that one could easily pack these 41 carton boxes in 3 metallic cases. So, a moderate guess on the number of post 2000 pages is : 35000. November 13th 2015 is to the French what 9/11 is to Americans (and 22 March 2016 is to Belgians, I’m sad to add). It is also precisely one year after Grothendieck passed away in Saint-Girons. On that particular day, the family decided to hand the Grothendieck-collection over to the Bibliotheque Nationale. (G’s last wishes were that everything he ever wrote was to be transferred to the BNF, thereby revoking his infamous letter of 2010, within 7 months after his death, or else had to be destroyed. So, to the letter of his will everything he left should have been destroyed by now. But fortunately none of it is, because 7 months is underestimating the seriousness with which the French ‘notaires’ carry out their trade, I can testify from personal experience). While the attacks on the Bataclan and elsewhere were going on, a Mercedes break with on board Alexandre Jr. and Jean-Bernard, a librarian specialised in ancient writings, was approaching Paris from Lasserre. On board: 5 metallic cases, 2 red ones, 1 green and 2 blues (so Leila’s picture missed 1 red). At about 2 into the night they arrived at the ‘commissariat du Police’ of the 6th arrondissement, and delivered the cases. It is said that the cases weighted around 400 kg (that is 80kg/case). As in all things Grothendieck concerned, this seems a bit over-estimated. Anyway, that’s the last place we know to hold Grothendieck’s Lasserre gribouillis. Let’s just hope for the best. That the initial plan to open up the gribouillis to the mathematical community at large will become a reality.